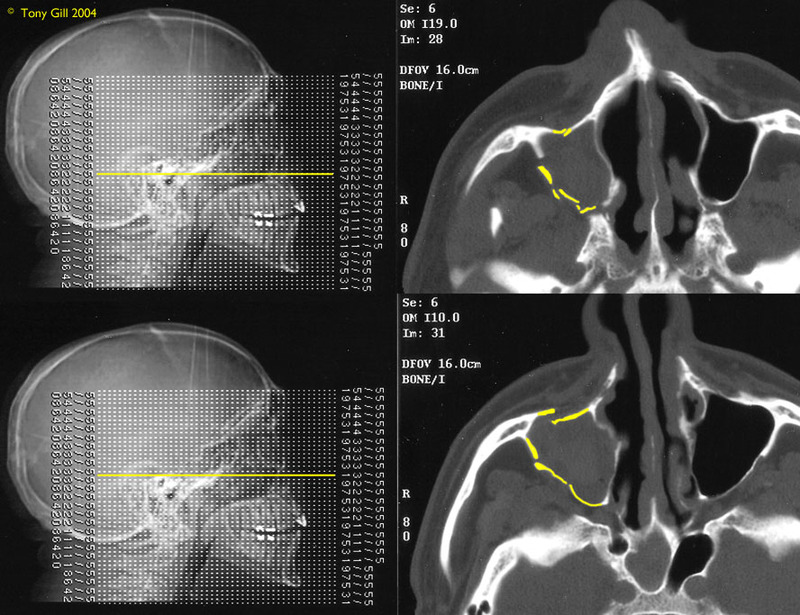 I finally got the results of the CT (Computerized Tomography, a true marvel of modern science) scan of my facial bones on Monday, after getting banged up in a snowboarding collision about a month ago (see St Valentine’s Day Massacre, blog passim). It turns out my maxilla, which is part of my skull and which my top row of teeth are attached to, has multiple internal fractures. although fortunately they are not LeFort Fractures (LeFort was a French physician who studied facial injuries by dropping heavy objects on cadaver skulls!). Amazingly, Dr Zimbler (I found out today that he’s a plastic surgeon!) said that there’s no need for surgery or any further action; the bones and the damaged nerves will eventually heal, my sinus will eventually drain (gross!) and there are no cosmetic requirements since I look completely normal. The only remaining problem I have is a “maloccluded bite” — my teeth don’t close together properly — so I have to see an oral and maxillofacial surgeon. And buy a snowboarding helmet. This entry was posted in Uncategorized on 10 March 2004 by Tony.